When I turned on the TV Saturday and saw the PNC Father/Son Challenge on NBC I thought this will be a nice relief from all the horrible news on TV this week. In the opening recap of early play, of day one, I was delighted (O.K, thrilled) to see a father and daughter team in the lead. I even tweeted about it. For the purpose of this post, I thought it would be fun to focus on the daughters of the PNC Father Son Challenge. (1) Bernard and Christina Langer – Bernard Langer won the Father/Son Challenge in 2005 and 2006 with his son, Stephan. Boy, no pressure on Christina! Christina is a talented golfer and is a freshman on the golf team at Florida Atlantic University. It really was a father daughter event with Bernard’s other daughter, Jackie, on the bag. Bernhard looks on as Christina lines up her putt. Christina gives her father a kiss at the end of the round after he makes his putt. (2) Fuzzy and Gretchen Zoeller – Gretchen is a former college golfer and in 2009 she was the caddy on her father’s bag at The Masters. There was an interview on NBC and Gretchen was talking about her father and it was wonderful to see Fuzzy’s reaction to his daughter’s declarations of respect and love. It was also interesting to watch her play and see that the “apple does not fall far from the tree” – she was animated and fun to watch (just like her Dad). Watch the PGA Tour video recap (35 second mark in video) to see Gretchen’s bird imitation! 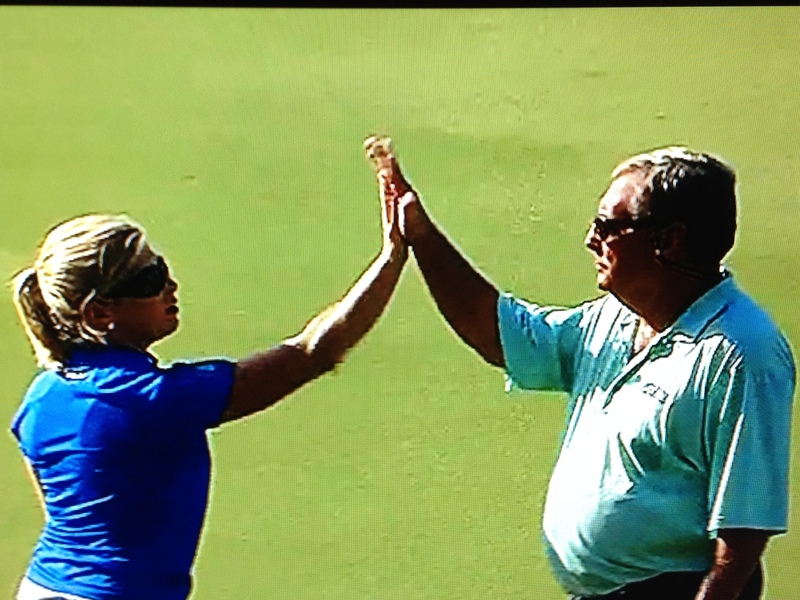 Fuzzy giving Gretchen a high five after a birdie on the 9th hole. The father daughter teams did well but neither won the tournament. The results are that the Zoellers tied for sixth place with the Nicolas and Furk teams and the Langers finished in 10th place. The Zoellers also had low round of the final day with a 60 (the Nelsons also got a 60). The winners were David Love III and his son Dru. They beat the Nelsons by one stroke which was nice because the Nelsons beat the Loves in 2008. This is the first year the tournament has been played since 2008 so the Loves waited a long time to beat the Nelsons. The Nelsons have won three times (2004, 2007, and 2008). Watch the PGA Tour Monday Backspin Video Recap for a nice overview of the Tournament. This entry was posted in PGA Tour, Women and Golf and tagged Bernard Langer, Christina Langer, Davis Love III, Dru Love, Fuzy Zoeller, Golf, Gretchen Zoeller, PGA Tour, PNC Father/Son Challenge by C. Baker. Bookmark the permalink.